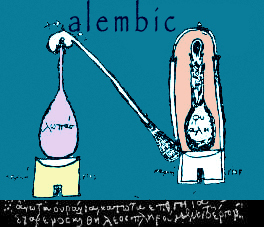 Have a look on Wikipedia and you will see that an alembic is a retort, an alchemical still. Nowadays the word alembic has taken on a metaphorical meaning, relating to anything that refines or transmutes. It’s a process of distillation as in the alembic of creative thought. That’s what we do, we transform ideas and thoughts into digital videos that engage, entertain and inform their intended audience. Alembic tv - creating moving images.